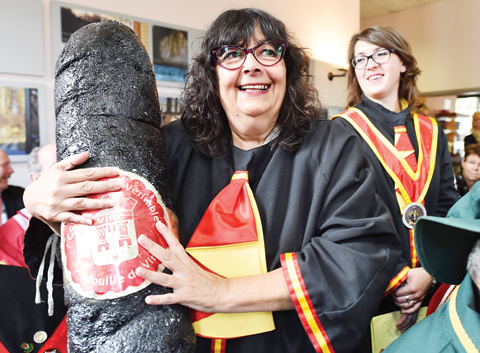 A member of the brotherhood of the “True Andouille of Vire” presents an plastic andouille oversized specimen. On a Saturday morning in September in the Normandy countryside a group of men and women gather for an ancient French initiation ceremony. The merry band bustling about in colorful robes and hats, with oversized medallions hanging around their necks, could be performers in a Shakespeare troupe, members of a medieval guild, maybe even druids. But the glazed pot perched on the top table in the hall in Bagnoles de l’Orne-laden with symbolism like the potion-filled cauldron in the Asterix comics-gives the game away. Those gathered are elders in the area’s gastronomic “confreries” or brotherhoods, there for the annual general meeting of an order set up, in this instance, to promote the culinary delights of the lining of a cow’s stomach. Placing their right hands on the pot, its two newest members, Arlette Allix, 70, who used to work in communications, and her 71-year-old husband Christian swear to become ambassadors for tripe-specifically the famous skewered tripe of nearby Ferte-Mace-and to uphold Normandy’s tradition “of eating and drinking well”. With a tap of a bone on the right shoulder, the “grand master” inducts them into the association and presents them with their red-and-green regalia as well as medallions stamped with a pot and a small skewered bundle. Seven emissaries from other fraternities are also made honorary members of Ferte-Mace’s venerable tripe brotherhood. And then it’s off for a parade through town, followed by a five-course meal at a Michelin-starred restaurant where, naturally enough, the plat de resistance is a steaming plate of tripe. Similar scenes play out nearly every week across France, home to around 1,500 “confreries” with over 10,000 members-mostly pensioners who are not involved in the production of the delicacy in question. They receive subsidies to crisscross the country promoting their region’s produce and partaking in ritualistic food feasts. “We’re an association of good-timers,” Jean Traon, the jocular co-grand master of Ferte-Mace’s tripe fraternity, admitted to AFP. “But we enjoy in moderation,” the 73-year-old former police captain emphasized. “We’re one big family!” said Marie-Chantal Eudine, the 74-year-old grand dame of the Bayeux pig society who was one of the guests, cutting a dash in a musketeer-style hat with a yellow plume. The “confrerie” tradition dates back to the Middle Ages, with one of the oldest originating in 12th-century Saint-Emilion, a wine-making town near Bordeaux that was at the time under English rule. In 1199, King John entrusted its aldermen with running the town in return for a promise to give England priority access to the fruits of its vines. Saint-Emilion’s wine brotherhood went on to spawn imitators for everything from oxtail and truffles to barley sugar sweets made by Benedictine nuns. Banned during the French Revolution, together with religious orders, the cultish “confreries” underwent a revival in the second half of the 20th century, spurred by concerns over the rise of industrial “malbouffe” (bad food). Some serve as little more than a pretext for merry-making but others wield significant economic and political clout. “The rituals may be of another age but there is a positive effect” on producers of the delicacies, said Joaquim Pueyo, MP of the Orne region who was among a handful of politicians attending the weekend festivities. The fact that local butchers continue to churn out tripe-a humble leftover from a leaner bygone era with a small but committed fan base in northern France-is in no small part due to the efforts of the brotherhood, Pueyo argued. “We cannot keep up with demand,” Guillaume Delignou, a 29-year-old who recently took over one of Ferte-Mace’s best-known butcheries, confirmed. It’s not just greying gourmets that wear brotherhoods’ colors with pride. Several former presidents have agreed to fly the flag for local produce as a sign of their commitment to France’s culinary heritage, which was honored with a UNESCO world heritage listing in 2010. Jacques Chirac, a man with a legendary appetite, was inducted into a brotherhood for calves’ brains, while Francois Mitterrand was a champion for cassoulet, a sausage and bean stew. Emmanuel Macron was the prize catch at this year’s Paris farm fair for the society of the piebald Bayeux pig, with the order’s grand mistresses making him an honorary member when he visited their stand. Many politicians from rural constituencies agree to bat for several brotherhoods, like Nathalie Goulet, senator for the Orne region, a vegetarian who nonetheless plumps for black pudding, white pudding and tripe among other local favorites including camembert. Addressing the crowd gathered for lunch at the Manoir du Lys, she credited her victory in last year’s Senate elections to the fact that she was wearing her “lucky charm”, the skewered tripe medallion.